Opalescent Nudibranch – 3 Distinct “Hermissenda” Species in the North Pacific Ocean. As a result of making the following post on social media, I learned that there has been a change in classifying the “Opalescent Nudibranch”. It was Robin Agarwal who educated me and shared the following incredible photo from Monterey, California. As you can see, the species on the left is more similar to the one I posted and which we call the “Opalescent Nudibranch” in British Columbia. However, it has been determined (2016) that there are 3 species in the “Hermissenda” genus (all are up to about 9 cm long). One is found in the Northwest Pacific Ocean from Japan to the Russian Far East so there is no worry about confusing that one on our coast. But, for the other two species, their range overlaps in Northern California where Robin took the photo. This has of course led to the need for two common names to differentiate them there. The species on the right is being referenced as the “Opalescent Nudibranch” (reinstating the species name Hermissenda opalescens). The one on the left has retained the name Hermissenda crassicornis and is being referenced as the “Thick-Horned Nudibranch” where the species ranges overlap. However, off British Columbia’s coast we are only likely to see the species on the left with its range being from Alaska to Northern California. Thereby, I anticipate this beautiful species will keep on being referenced as the “Opalescent Nudibranch” in the vernacular. What are the differences between these two species? 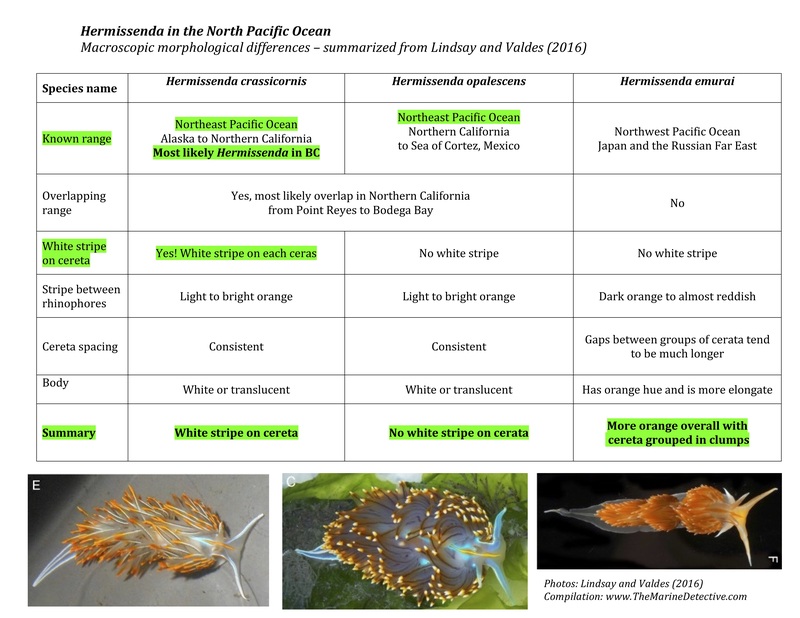 I am so glad you asked as I totally nerded out and made a summary table to differentiate the 3 species reported in the research “The Model Organism Hermissenda crassicornis (Gastropoda: Heterobranchia) Is a Species Complex“. The table is just for you my fellow nudibranch nerds. But, I’ll cut to the conclusion. Don’t be fooled by the colour of the two species found in the Northeast Pacific Ocean. The colour of the cerata in BOTH species can vary from light brown to dark brown to bright orange. Cerata are the structures on some sea slugs species’ backs that have both a respiratory and defence function. The tips contain the stinging cells (nematocysts) of the nudibranch’s prey e.g. hydroids. The easy way to differentiate the two Hermissenda species in the Northeast Pacific Ocean, is to look for white lines on the cerata. The species most often found off the BC Coast has white lines. The other does not. See my photo below to note this easily identifiable feature (and, if you need some amusement, have a look for the little hermit crab). And now, for that summary table I promised you. Then, more photos of the beautiful Hermissenda species found off our coast – Hermissenda crassicornis. I share these to show the variation of colour in the species but also, because by any name and classification, there can never be enough photos of such a stunning ambassador for the colour and biodiversity found in these cold, dark seas. Source of table information and photos: Lindsay, T., & Valdés, Á. (2016). The Model Organism Hermissenda crassicornis (Gastropoda: Heterobranchia) Is a Species Complex. PLoS ONE, 11(4), e0154265. http://doi.org/10.1371/journal.pone.0154265. Click to enlarge. See my previous blog at the link for “Attack of the Sea Slugs” in which one Opalescent Nudibranch attacks another. Feeding on Orange Hydroids. ©Jackie Hildering. Hermissensa crassicornis feeding on Bushy Pink-Mouth Hydroids. Red-Gilled Nudibranch also snacking away in the background.©Jackie Hildering. Hermissensa crassicornis on Eel Grass. ©Jackie Hildering. With a “Jointed Three-Section Tubeworm”. ©Jackie Hildering. Feeding on hydroids, Red Soft Corals to the left and crawling on a Red Ascidian (highly advanced invertebrate, the most advanced of all in the image). ©Jackie Hildering. Hermissensa crassicornis feeding on Pink-Mouth Hydroids. Here you can very clearly see the distinctive white lines on the cerata. ©Jackie Hildering. Hermissensa crassicornis on Bull Kelp. Hooded Nudibranchs in the background. ©Jackie Hildering. On Red Soft Coral. ©Jackie Hildering. Why is our cold ocean suddenly tropical blue? Who Goes There? Dizzying tracks in the sand. This is a most fascinating posting. Thanks for all of it, its beauty and the differences as you have pointed out. Most interesting. I never come near your site without leaving with a whole lot of new information. Thanks sgain.